Hillsboro resident Anthony Garretson, left, helps 3-year-old Violet Nihart of Wilmington net a trout she reeled in Saturday during the Highland County Rod & Gun Club’s annual Trout Derby at Rocky Fork Lake. 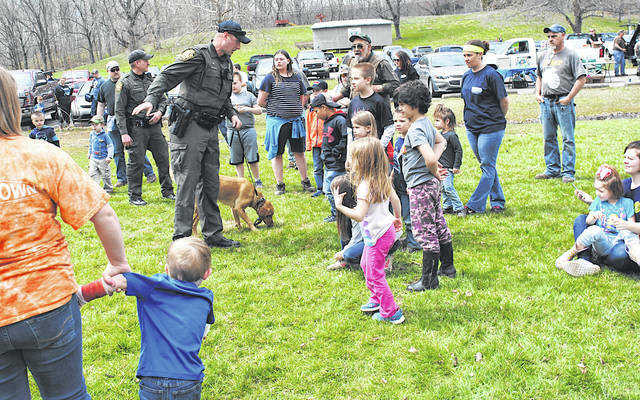 Warren County Wildlife Officer Jason Keller and his dog Scout give a demonstration Saturday at the Trout Derby showing how a dog trained like Scout can be used to help wildlife officers find things like animal parts or other items they may be looking for. 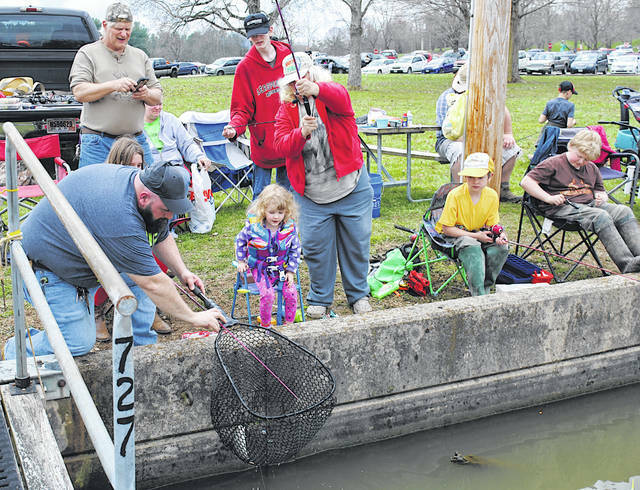 An estimated 425 kids enjoyed one of the more pleasant days in the recent history of the Kid’s Trout Derby held annually on the first Saturday in April at Rocky Fork State Park. Now nearing 20 years old, the event is put on each year by the Highland County Rod & Gun Club, Ohio Division of Wildlife and Ohio Division of Parks and Recreation, with help from lots of sponsors. Tim Schlater, president of the Rod & Gun Club, said attendance was up from about 300 kids a year ago, and that he attributed the crowd to the weather. He said that while the rain date for the event has never had to be used, this was the first year in recent memory that the weather was actually nice. He said that while it’s hard to guess with that many kids fishing, he thought maybe 300 to 400 of the 1,500 trout that were stocked in a netted area of the lake for the event were caught. “Actually, the weather could not have been better, the fish were biting pretty good — not great, but pretty good — and we were very happy and satisfied,” club member John Kidder said. Each kid received a lure for registering for the Trout Derby, except for about 30 kids that instead received rod and reel sets. Landon Fletcher won a trail camera for landing the first trout, and three kids — Devon Ewing, Bricen Lamb and Emelee Shoemaker — won $100 bills for catching one of 15 specially tagged fish. Those fish were sponsored by the Highland County Coonhunters, Ohio Division of Wildlife and Rack Attack Sports. Prior to the Trout Derby, held from 1-4 p.m., shotgun shooting and archery were offered for kids to try with help from instructors. Each kid got to shoot a shotgun twice and Schlater said about 400 rounds of ammunition were fired. Everyone including adults that attended with children were treated to hot dogs, chips, ice cream and drinks. One of the fish was reeled in, mostly at least, by 3-year-old Wilmington resident Violet Nihart. Hillsboro resident Anthony Garretson netted the fish for her and she had some help with the fishing pole while she reeled the fish in. Kidder said there are plans to hold the event again next year, if the club can find enough sponsors. He said that in the past the Ohio Division of Wildlife provided a nice grant to help fund the event, but this year the amount of the grant was cut back significantly, and he’s heard the grant may not be available at all next year. “We value our sponsors. I tell you what, we really do,” Kidder said. This year’s sponsors were Rack Attack Sports, Highland County Coonhunters, ODNR Division of Wildlife, ODNR Division of Parks and Recreation, Aaron’s, Sunrise Sunset Child Care, Bayview Bait, Community Markets, Cashland, Buckeye Boat Repair, 4-H Shooting Sports, Mike Parker, Town & Country, G & J Pepsi, LaRosa’s Pizza and Tractor Supply Co.